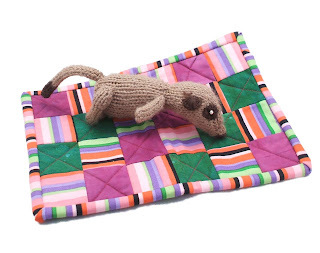 After leaving Minnesota, Alchemy went to Wisconsin, to KimsCraftyApple where she went on an Easter Egg Hunt, to a 90th birthday party and helped to make this sweet little quilt for the giveaway! Next stop was the Arizona desert, where Waterrose took Alchemy on the most hair-raising adventures of her life. She went off-roading and rock-climbing, and scared Niftyknits half to death! She added a lovely little meerkat-cuff (or human-sized embroidered ring) to her giveaway stash. Travelling on, Alchemy went to meet up with Fishstikks in Las Vegas, where she found Elvis and met lots of big-eyed birds and then (shock!) learnt to play poker before collecting two more fabulous souvenirs, a badge and a tiny little house. 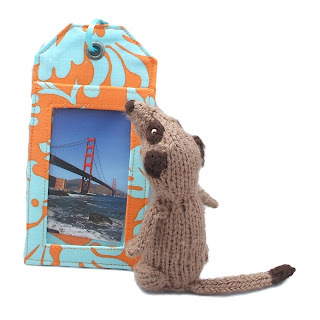 Alchemy's next stop was in Washington, where she stayed with StudioCherie and watched MeerkatManor - which of course was why NiftyKnits first designed and knitted the very first meerkat. Cherie gave Alchemy a luggage tag to bring back for the giveaway - no danger of losing your suitcase with this! 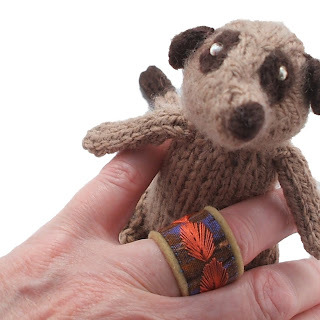 The tour was now over, and and a tired little meerkat headed back across the pond to Niftyknits, to rest and await news of the lucky person who will give her a new home, along with her wonderful haul of goodies! Still another prize though - remember the super interactive map? 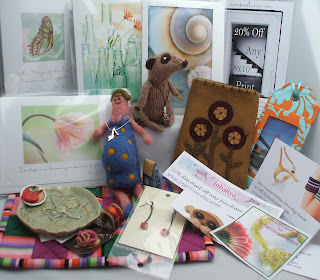 Tyarkoni has given a voucher for 20% off any of her 8"x10" prints - so the total prize package is now vouchers to spend in five separate shops, an ipod cosy, a quilted mat, a silver shoe pendant on 18" chain, a felt lady, earrings, four Art cards, an embroidered ring, a mini-fascinator, a luggage tag, a horsehair cellphone charm, a papier mache house and badge, a trinket dish and of course Alchemy herself! I reckon these have a value of around $175 at least, not including the discount vouchers as their value will depend on what you choose. So...here's the bit you're all waiting for! How can you enter? The giveaway will be hosted on our Etteam blog and will start Tuesday night/Wednesday morning, depending on your timezone. There you will find a list of all the lovely Etsians who hosted Treasure or Alchemy, and made this tour such a wonderful adventure. Go to one of their shops, pick your favourite item and come back to the Etteam blog to post the link of that item. Don't forget you MUST leave contact details - shop/twitter/facebook/email whatever! You can enter once for EACH host, we'll pick a random winner and let you know who wins on the World Tour Facebook page on Monday 5th July. Good luck! What a great way to do the giveaway. Since we have seen most of the prizes in person, I can tell you my daughter REALLY wants to win. We loved having a turn with Alchemy. Counting down the hours til the giveaway begins. : ) Love that little house by Fishstikks! Woo Hoo....what a bunch of goodies....and to win Alchemy would be wonderful! This is so much fun! I love these little meerkats, following them around the globe has been such a joy! I even had to pleasure of having one come and visit me for a short time...we had a huge snowstorm! WooHoo! What fantastic prizes! Still crossing my fingers that Alchemy will be returning to Wisconsin! Wow - that's a lot of cool stuff!!! What an amazing stash of goodies! Not to mention sweet little Alchemy her/his self! What a life Alchemy has had already! 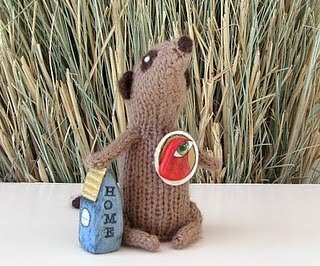 I am sure she is looking forward to her new adventures and the new home that awaits her! what an amazing trip! how fun!